The safe motion monitoring modules for the configurable control systems PNOZmulti 2 ensure safe monitoring of your drives. The extension modules, together with a base unit PNOZ m B0 or PNOZ m B1, monitor one or two axes. The safe motion monitoring modules for PNOZmulti 2 are easily configured using the software tool PNOZmulti Configurator. The tool can also be used to configure an independent module program (mIQ), which is then executed directly on the Motion Monitoring module. This brings significant benefits to you as the user: fine-granular configuration of several monitoring areas - such as velocity or rotational speed - is possible, which are then locally executed on the expansion module. That means greater flexibility for you as the user. Convenient diagnostic facilities and a wide variety of fieldbus and communication options are also provided. All standard incremental encoders can be connected using drive-specific connection cables via an industrial interface, characterised by particularly high durability. 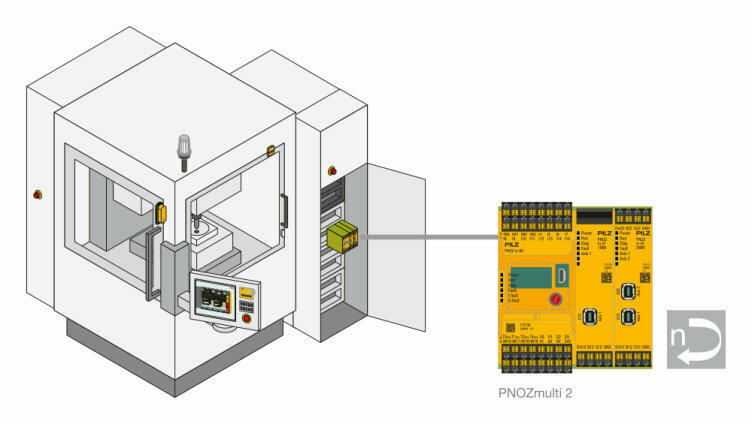 With various blocks in the software tool PNOZmulti Configurator, the safety functions can be implemented quickly and easily.